We have worked on hundreds of adoptions and can guide you through the process to secure your legal relationship with your child so that you will have all of the rights and obligations of a biological parent. A right to make important decisions for your child. Standing to file for custody or visitation of your child. The right to be supported by you. The right to inherit from you if you do not have a will. The right to receive benefits from your employer, and from the government on your behalf. We can help you with the two types of adoptions in New York state: private-placement and agency. Private-placement adoptions are arranged through direct communication between consenting biological and adoptive parents. We also assist with the court process when adopting parents have used an adoption or foster care agency to assist them in identifying a child. We meet with you to learn the unique circumstances of your family. We will walk you through the process, and will give you “homework” – information to collect and documents you must gather. In most cases, one or both of the child’s biological parents must agree to the adoption. We will prepare the consent forms and send them to the biological parents to sign. 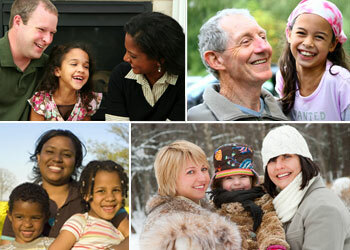 We will recommend an adoption social worker who will meet with you and prepare an adoption home study for the Court. The Court reviews the forms, asks for more information when needed, and then the adoption is scheduled. You and your child appear in court. The judge meets with you, your child, and your lawyer. Simple questions are asked, papers are signed, and your adoption is completed. Your child will then get a new birth certificate in the mail from the state, listing you as the legal parent.